November 29, 2018 11:41 pm. Jebel Ali Racecourse stages the only race meeting in the UAE this weekend, a seven-race card on Friday highlighted by a handicap over 1800m. Twelve have been declared, with a quartet from trainer Doug Watson and stable jockey Pat Dobbs electing to ride Dehbashi. Third on his seasonal reappearance at Meydan, four-time winner Dehbashi is owned by Mohd Khalifa Al Basti, as is stable companion Bowditch, a fascinating local debutant after his AED 500,000 purchase at April’s ERA Racing in Dubai Sale. A 3-year-old by Nathaniel, he won his final two starts on all-weather surfaces in England for John Gosden and Princess Haya. Nathaniel, of course, is the sire of superstar seven-time Group 1 winner Enable. 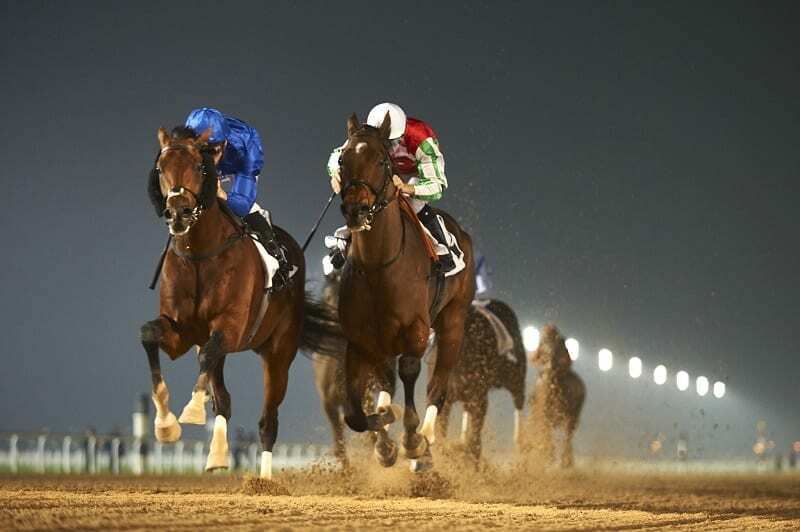 “Dehbashi tends to run well at Jebel Ali, so Pat has chosen him,” Watson said. “He has the advantage of a run this season, whereas Bowditch is having his first start for us and since March. We really like (Bowditch) and he has been working well. Hopefully he will handle the conditions and be a nice new horse for us. Top Clearance, owned by racecourse patron His Highness Sheikh Ahmed bin Rashid Al Maktoum, is trained on the track by Nicholas Bachalard, but is entitled to need this run on his seasonal bow under Chris Hayes. A Group 1 performer in the U.S. for three-time Breeders’ Cup winner Wayne Catalano, his best is dangerous, but not expected first off the layoff. Over course and distance, in January of this year, and over 1950m in December 2017, Dehbashi chased home Interconnection and Galles respectively, both in Friday’s line-up for Sandeep Jadhav. He also saddles Rio Tigre, who gets the vote from stable jockey Royston Ffrench and exits a course and distance handicap victory two weeks ago. Of his stable companions, as well as winning at Jebel Ali, Galles was also second in the 1950m Jebel Ali Stakes (Listed) in February when Interconnection was sixth. The race is sponsored by His Highness Sheikh Hamdan bin Rashid Al Maktoum via his Shadwell breeding empire and his own world-famous blue and white silks will be carried by Mudaarab. In the capable hands of Erwan Charpy, the 4-year-old gelded son of Distorted Humor, twice a winner in England for Sir Michael Stoute, had just four runs last season for his new trainer in his first UAE campaign. Retained by the owner, Dane O’Neill rides. Juvenile runners are fairly rare at Jebel Ali, though it should be remembered subsequent UAE 2000 Guineas (Group 3) and UAE Derby (Group 2) winner Victory Moon made his first local start at the course in December 2002 (though, foaled in South Africa was already a 3-year-old), but a pair of 2-year-olds face 13 rivals in the concluding 1000m maiden. Of the two, Bosconero was beaten a long way on his recent debut at Meydan for Ali Rashid al Rayhi, while Jaarim, the mount of Royston Ffrench, is making his racecourse bow. Owned and trained by Fawzi Nass, he cost $200,000 as a yearling at Keeneland in September 2018 and is a half-brother to Bayerd, who defeated the brilliant Frosted in Saratoga maiden ranks before landing Remington Park’s Springboard Mile Stakes a few months later. It should be noted that with Jebel Ali staging seven races every meeting this season and with winter drawing in, the action begins at 1.45pm to ensure race seven will be contested in daylight.